Mitch Gallagher was introduced to music as a child by his mother — who was herself a child recording artist with her siblings, The Fried Sisters. In grade school he sang in the boys choir and took up trombone, which he played until high school. But his musical life came into focus when he was given a copy of Kiss Alive!, which led him to take up the guitar at age 15. Armed with a cheap guitar purchased with money earned working at his father's plumbing shop, he began teaching himself to play along with the records of the stadium rock heroes of the day: Rush, Aerosmith, Boston, Frank Marino and Mahogany Rush, Jimi Hendrix, the Atlanta Rhythm Section, Ted Nugent, and, of course, the mighty Van Halen! Before long, he and his brother had formed their first rock band, Blitz, in their parents' garage. Numerous gigs at school dances and parties soon followed. Gallagher was introduced to recording when the manager of Shatter, the rock band he was in, loaned him an original TASCAM PortaStudio 4-track cassette recorder. While continuing to play guitar and sing at every opportunity, he studied electrical engineering and computer science at North Dakota State University, eventually earning a Bachelor of Arts degree in music from Moorhead State University (now known as Minnesota State University - Moorhead). During college he taught up to 30 private guitar students a week and gigged nearly every weekend. His graduate studies at the University of Missouri in Kansas City included music composition and classical guitar. He also began his music industry career in Kansas City, in gear retail and as a guitar repair tech. He recorded albums for artists in his project studio, ran live sound for local and national artists, and created "sound-a-like" recordings for radio. As a member of The Billy Doores band, he regularly opened for major country artists performing in the K.C. area. He also began writing instructional materials and ran a music technology consulting business known as "MIDI-Info." 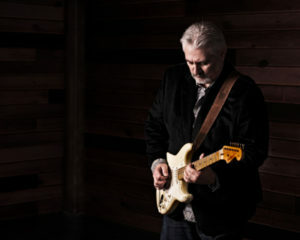 Mitch toured as lead guitarist/vocalist in rock and country bands, and also played with big bands, fusion and experimental music groups, and as a classical and steel-string guitar soloist. As a classical guitarist, he studied with Michael Coates, Douglas Niedt, Jason Vieaux, and Denis Azabagic. He has performed in master classes with William Kanengiser (founding member of the Los Angeles Guitar Quartet) and Italy's Lorenzo Micheli. As a composer, he studied with Henry Gwiazda, Gerald Kemner, and James Mobberley. His compositions cover genres from classical to experimental to jazz to heavy metal. Prophecy #1: At First Glance, an experimental percussion ensemble/synthesizer work based on the Fibonacci number series, received a 1991 NARAS (Grammy) award in the Best New Music/New Classical category. He lectured on his 3-part Prophecy series of electronic music compositions and was a featured artist at the 1994 International Computer Arts Festival in Sofia, Bulgaria. Gallagher served as the Senior Technical Editor of Keyboard magazine and was the Editor-in-Chief of EQ magazine. He has published well over 1,000 articles in magazines such as Premier Guitar, Guitar Player, EQ, Acoustic Guitar, Keyboard, Performing Songwriter, Pro Sound News, Extreme Groove, and many other domestic and international publications. He is also the former Editor of Church Sound magazine, and former Associate Editor of Live Sound magazine. As a guitar tone expert and music technology specialist, he teaches college courses, lectures, gives clinics and workshops, consults with pro audio manufacturers, and speaks at festivals, conventions, and conferences around the world. His books include Make Music Now! (Backbeat Books), Pro Tools Clinic: Demystifying LE for Macintosh and PC (Music Sales/Schirmer Trade Books), The Studio Business Book, 3rd Edition (Artist Pro Publishing), Acoustic Design For The Home Studio (Artist Pro Publishing), The Music Technology Dictionary (Cengage), Mastering Music at Home (Cengage) and Guitar Tone: Pursuing the Ultimate Guitar Sound (Cengage). His instructional DVD/interactive course, Multi-Platinum Mastering, was released by Multi-Platinum.com. Mitch has been the Editorial Director for Sweetwater since 2005, where he has hosted more than 1,500 videos — artist interviews, product demos, instructional videos, and more — as well as written countless articles for Sweetwater.com, inSync, ProGear, and Sweetnotes. Gallagher resides in Fort Wayne, Indiana, with his wife Fe and their two dogs, Oliver and Baxter. When he's not playing guitar, writing music, or cranking out words or a video, you can find him sampling his collection of fine Scotches and bourbons, pursuing the ultimate Old Fashioned recipe, reading one of the countless books in his library, whipping up gourmet meals, or playing racquetball. He performs regularly on guitar and vocals with the band Expanding Man. His new release is a 5-song EP, FOUNDATION.